Novius OS is designed as an applications platform, hence the ‘OS' suffix. By selecting applications amongst existing ones or creating your own custom applications, you tailor the CMS to your content—not the reverse. With Novius OS, your content is well-structured and therefore ready to be published to any communication channel: website, newsletter, social media, blog and more. Manage all of your digital communication with one single tool. Read our vision. No extra plug-in nor advanced configuration is required to manage multilingual content with Novius OS. What's more, the interface is available in 6 languages (including English, Spanish, French, Russian and Japanese) and new translations are regularly added thanks to the community. The architect draws the plans, the system follows them. “Build your CMS” is Novius OS philosophy, an adaptive CMS designed to power websites tailor-made by content professionals. Working from your computer or tablet, either alone or with your team, is straightforward thanks to the smart interface. Being thought for professionals, Novius OS allows multi-tasking: tabs make you more efficient and your workspace is saved between two sessions. Media files, whatever channel they come from, are all centralised and organised in the Media Centre, so you can easily re-use them. Applications can adjust images to their requirements (e.g. resize, crop) and all files are optimised for search engines. Developers too will love Novius OS. Built with the latest web technology, it provides them with many development tools: ‘Build your app' wizard, unified UI, behaviours and more. Novius OS is Open Source, get involved! Novius OS is an Open Source project (distributed under the GNU AGPL v3 license) for more transparency and openness. From Japan to the USA, contributors are taking part in improving and promoting the project. Come meet us on the forum or GitHub, you are welcome. Change the line ServerName with your domain name when installing on a live server. 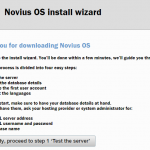 Change /var/www/html/novius-os with the folder you installed Novius OS into. Then, reload Apache to apply the new configuration. 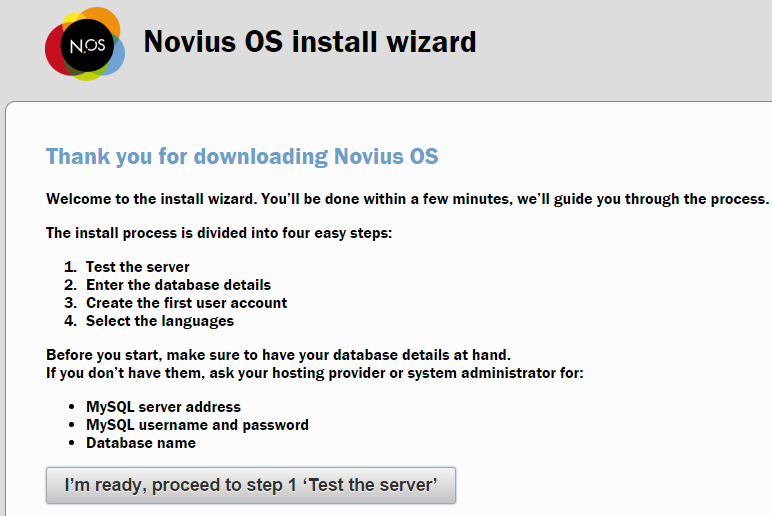 Open your browser at http://serverip/novius-os/ (replace novius-os with the directory name you’ve chosen) this will start the installation process follow the on screen instructions to complete the installation. Check the Novius-OS documentation for next steps.